Isuzu Introduces A Craft Beer Truck That Is Just As Awesome As It Sounds! According to the Brewers Association, craft beers reached an all-time high 23% share of the beer market in 2017, which equates to $26 billion (with a ‘B’) last year alone. That is an 8% increase over the previous year. Most these brewers are still local brewers and rely on community gatherings, live events and festivals to sell their product. The geniuses at Isuzu see this segment as a potential untapped (pun intended) customer base and have introduced their new Craft Beer Truck! This new vehicle is designed to act as both a refrigerated delivery vehicle during the week and a working portable bar for festivals on the weekends. The concept has already seen use by Bottle Logic in California. 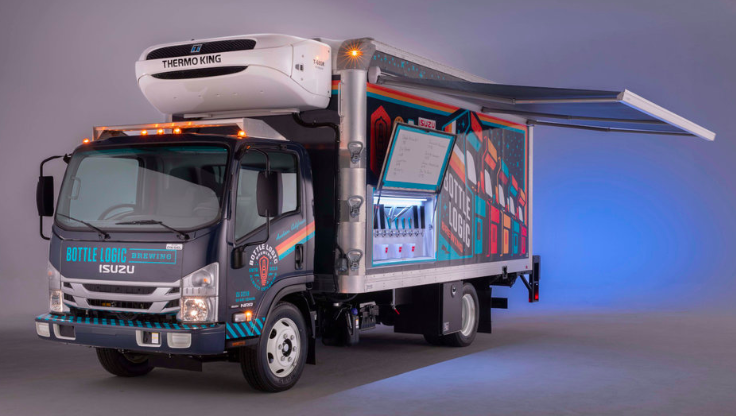 The truck features a 16 ft insulated storage area for kegs and beer crates that is kept cold by a Thermo King refrigerator unit and a lift gate in the back for easy loading and unloading. But the weekend festival scene is where this work truck transforms into its own party beer tent! The driver’s side of the body has an 8-tap beer station integrated into the side with a 10-gallon overflow tank and a special mounting on the body’s interior for the CO2 manifold. Covering the taps on the exterior, is a locking door that swings up to serve as a menu board. LED lights illuminate the taps. There is even a 15 ft awning that when opened up keeps the bartenders working the 8-tap beer station in the cool shade. There are also 2 lockable tool boxes underneath big enough to store folding tables, chairs and whatever else the staff may need while working the festival. There is no mention of a Wi-Fi hotspot but that is probably because so many POS systems can be simply done through any mobile device (Such as Square or PayPal mobile card reader). On behalf of all beer enthusiast: Well done Isuzu, well done! Or, you can join the home brewing community with this IPA kit from Brooklyn Brewing Shop! Previous Sons Of Anarchy Stars To Lead ‘Yogis Of Anarchy’ Yoga Class At Motor City Comic Con! My Husband and I throw a crawfish boil every summer and this would be great addition to the party. My Husband would love to this! Thanks for the idea. This is a great idea for a summer party! Looks really cool and exciting! Isuzu never fails to create innovative ideas!